Half of writing well is editing your own work, and it’s not always easy even for an experienced writer. I’ve been writing for 40+ years but sometimes still get lost in my drafts and stand there as confused as anybody. It happened just this week. I was writing a 1200-word op-ed on readable writing, as usual, but I lost control of it. I just wrote myself into a corner. The piece had many ideas and facts I wanted in, but I kept jamming new ideas in and it was disorganized. I couldn’t figure out what was wrong with it. I was really ticked off and about to give up on it. Sometimes, in that dark spot of desperation, a little voice speaks to me like Jiminy Cricket, and this time the voice said Do a reverse outline. I usually resort to this when I have kept adding ideas to an essay that don’t fit in smoothly. They sorta fit but they sorta don’t fit, and the resulting paper feels jumbled. A reverse outline outlines what you have already written. I used to think I invented reverse outlining but I can see from the Web that many have written about it. To my mind, they make the process too complicated, but if you want to see what they say, a halfway decent piece is here. But the simplest way to do it–and we’re professionals here who want to save time, yes?–is just to reformat your essay. Shrink the typesize a bit, and reformat it. Make a wide left margin of maybe 3 inches. Print it out. Now you have what you wrote, with a lot of white space to work in. Now do the reverse outline by reading each paragraph and summarizing it in a word–no more than a phrase or two–which you write by hand next to it. You can see your draft on the right, with a crude restatement of each paragraph on the left. That crude restatement is pure gold, though. Immediately you’ll be able to see the structural problems. Yesterday, for instance, I instantly saw my forecast sentence was sloppy. It only named one topic (scale) when the paper went much beyond scale. I immediately made it a three-part forecast (scale, cause, solutions) and and saw that the body would have to match it, of course. Now that I was predicting the middle of the paper as three topics, I could see what didn’t fit into those three boxes. I knew in a flash what to take out. Confusion was over. This can work fast. I think I did the reverse outline (actually two in a row) beginning at 5:15 pm, and I had the final draft done by 6:30. At 5:15 I was in the mood called this is crap, I’m lost with this crap and I want to quit but I reverse-outlined the piece and changed it, because I could see how. At 6:30 my mood was Hey, this works and I like it. That’s how I use reverse outlining to retrieve disorganized drafts, which seem to happen easily when writing on a computer, because it’s so easy to insert new ideas into the middles of paragraphs. The key for me is reformatting the essay with a wide left margin, and then working with that. Usually I shrink the size of the type to 9 or 10 points, which keeps the proportions of the new page the same as the original. In the image below, you see the two outlines I did one right after the other. (Click the arrow to see the second page.) The image is sketchy, but you should get the idea. This alteration of the layout and sketching in the left-hand margin helped me see the unbalanced structure of the actual paper. I saw right away how to balance it. The process took 75 minutes and it redeemed what had felt like a piece of garbage when I started. So you have a new tool to try as a writer–the reverse outline. 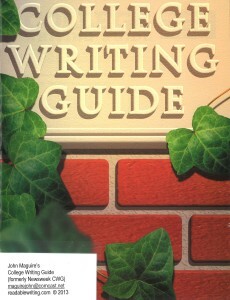 Are you new to teaching first-year college writing?